I was trying to match his brother's that I made a couple years ago! 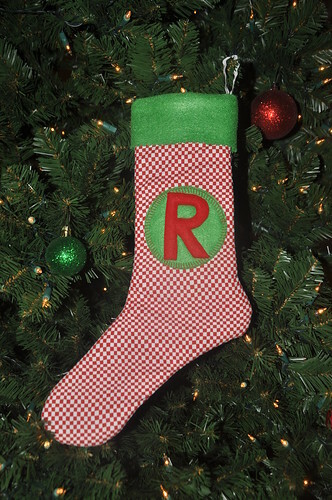 The stockings are just made out of a quilting weight cotton on the outside, inside I used fusible fleece, and the folded over top and letters are made out of regular craft felt. 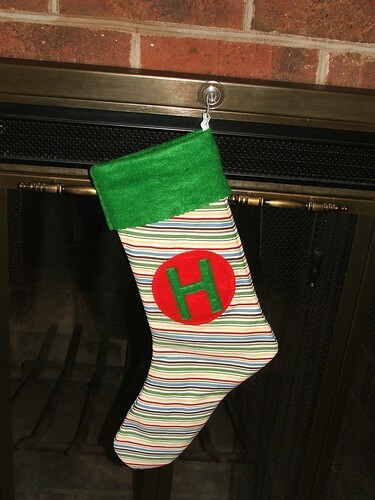 I used a stocking template that I found on Martha Stewart.com and improvised the rest! My sister in law came over to make some paper snowflakes with me and the boys, and she said she used to make snowflakes out of coffee filters. So we tried it, and they turned out better than the regular paper kind. 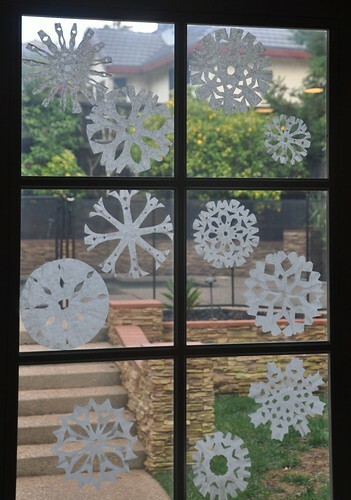 Since the filters are already circular, they were made into perfect snow flakes! Just fold the filter in half, then in half a couple more times and make your cuts, it was super fun! I kind of threw this together last minute, but for under $5 I thought it turned out cute! Just hot glued all the pieces on the wreath and easy peasy Holiday Wreath! These are so easy to make. Some of you have probably made them before, I know I made them when I was a kid and just had my 2.5 year old help me make some to fill in our tree! 2. Start with two clear beads turn end of the pipe cleaner around the bead. 3. Feed the rest of the beads continuing with 2 red beads, followed by 2 clear beads etc, until all the beads are used up. 4. When the last bead is added, bend the pipe cleaner around the bead. 5. Bend the top into a candy cane shape. 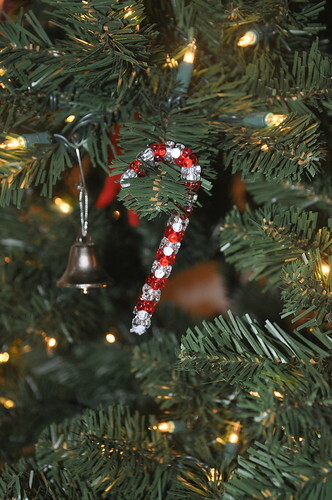 You can add ribbon to hang on your tree, but we just hang the ornament as is. 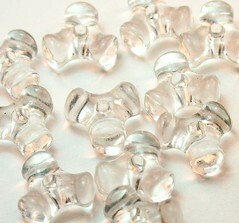 You can also use all translucent beads or green and translucent beads to make pretty variations, enjoy! 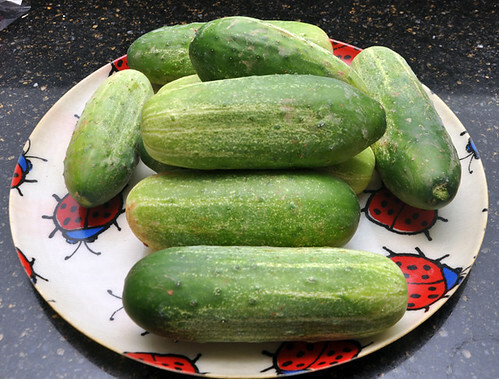 My neighbor, just brought over 7 pounds of cucumbers from her garden this afternoon. 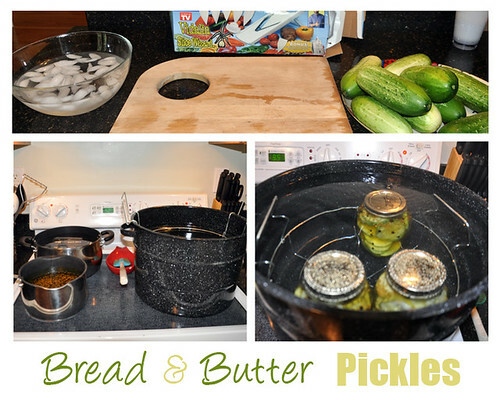 So I took it upon my self to make some bread and butter pickles! Can't wait to eat them in about 4 weeks or so! Combine vinegar, sugar, and spices in a pot and bring to boil, let simmer for about 5 minutes. 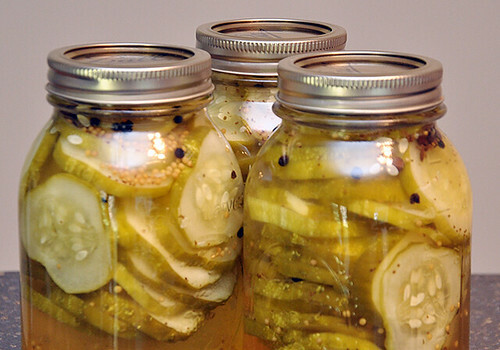 Slice cukes 1/4" thick and pack in hot jars. Slowly pour the hot pickling liquid over the cucumber slices, leaving about a 1/2" head space. Make sure there are no air bubbles by running a knife or chop stick around the inside of the jars, wipe rim clean, add lids and finger tighten. Process in a hot water bath for 15 minutes. Wait 3-4 weeks before eating. Enjoy! A recent trip to my local grocery store left me super disappointed when I was searching for fresh sprouts to add to my sandwiches. I thought they should be pretty easy to grow yourself. 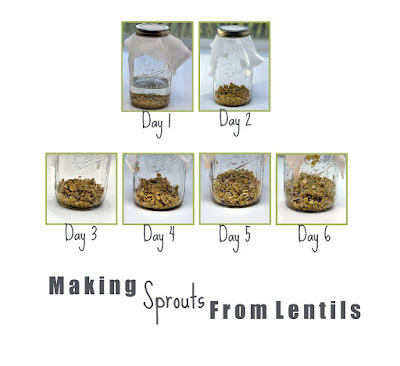 So I started surfing the web and sure enough you can make sprouts right on your windowsill, using all sorts of regular dried beans. 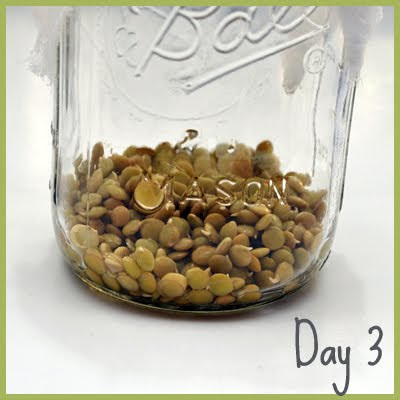 I came across this website classbrain and followed the directions, using a glass mason jar to sprout my lentils. From what I've read, lentils are a fantastic source of B vitamins, calcium, magnesium, zinc and much more. Since you can eat sprouts raw, you retain all of that incredible nutritional value, which is an A+ in my book! The only thing I would do differently next time, is maybe buy organic lentils in bulk. I'm thinking a better quality bean might grow a heartier and longer sprout. 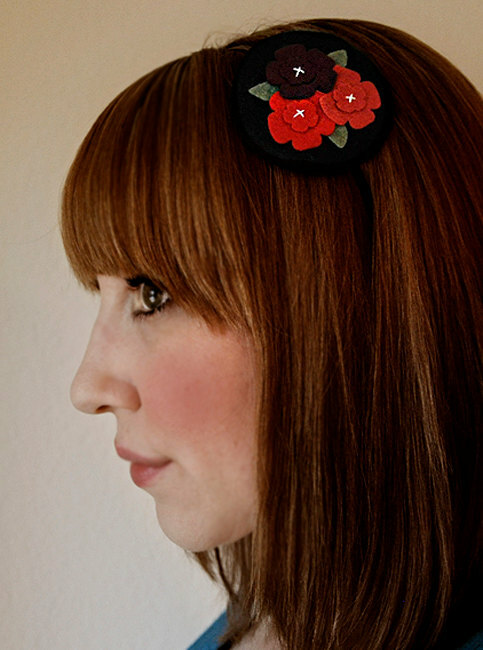 I'm also thinking of now investing in a fancy schmancy sprouter, since this was so easy to do! 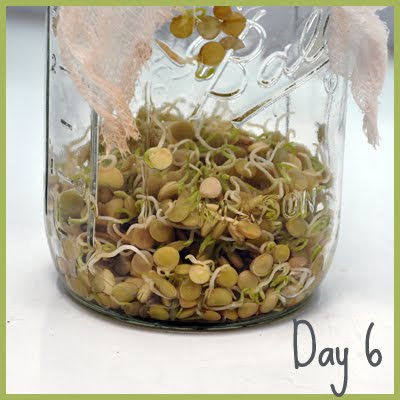 Below is a close up of day 3 when the lentils began to sprout, and day 6 when the sprouts were ready to eat! 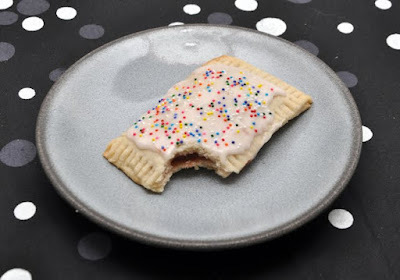 Okay, so I LOVE pop-tarts, who doesn't? 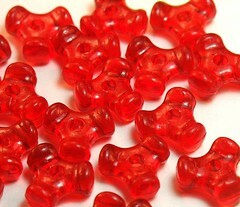 I don't however love that they are filled with HFCS, artificial colors and flavors. So I thought I would make my own, I know ambitious right? heh heh. I was searching different recipes online and most were vegan, so I came up with this recipe that is sure to please anyone! Mix flour and sugar with fork. Stir in oil and water, whisk with fork to thicken. Pour in flour and mix with fork. 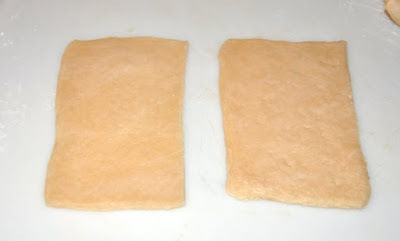 Roll out dough 1/4 inch thick and cut roughly into 10 - 2 1/2 x 3 1/2 inch rectangles. You can make them square if you wish or use your favorite cookie cutter shape. 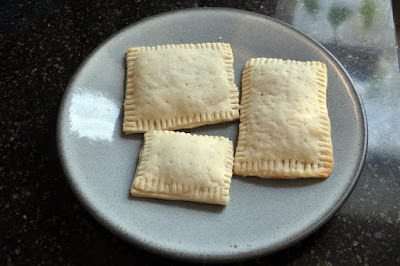 I wanted them to resemble real pop-tarts, so I left mine rectangleish. This should make about 5 tarts. 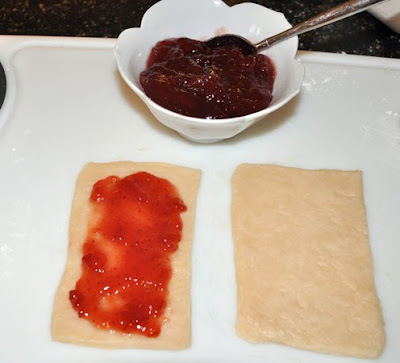 With a spoon put a dollop of your fruit spread in the middle of each rectangle, leaving about a 1/4 inch all around the sides. 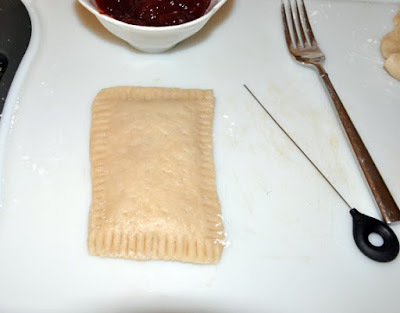 With your finger dab a little water on the edges and place another rectangle dough on top, pressing the sides down to seal. Take a fork and dip it in a little flour and press all four sides closed, making a nice seal. With a tooth pick, poke little vent holes on top. Bake at 400F until for about 15 minutes or until the edges turn a nice golden brown. Let cool completely before icing. To make the icing mix all the ingredients together until smooth, and more water if needed. Spread thinly over your tarts, and add sprinkles. Eat and enjoy! I hope you liked this recipe as much as I did, is was a nice little treat for me on a cold and snowy Monday! 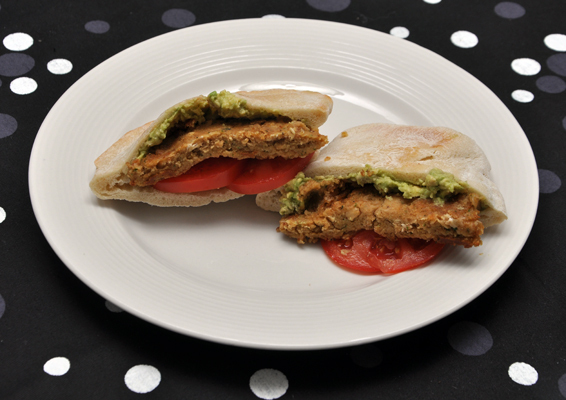 I've still been on the chickpea kick lately, so I whipped up some delicious falafel burgers on homemade pita bread. The bread was actually really easy to make, I don't think I'll ever buy it again. 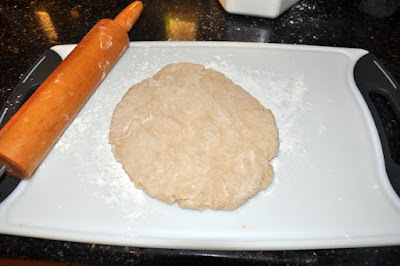 I used plain all purpose flour for mine, and found the recipe here. For the falafel burger I pretty much winged it, once I have a nice recipe I'll share. I roughly used this recipe and added rolled oats and bread crumbs. Anyway it definitely curbed my cravings, so this preggo lady is full and happy! Now that I'm preggo with number 2, all I've been craving is hummus! I have never been a fan of store bought hummus, so I always make my own. Cumin is the main ingredient for hummus to taste like hummus, I use it sparingly though so I would suggest starting out with 1/2 tsp and then adding more to your liking. Put all the ingredients in a food processor or blender and pulse, add the reserved chickpea liquid and blend until smooth & creamy. Serve with homemade pita or tortillas chips. 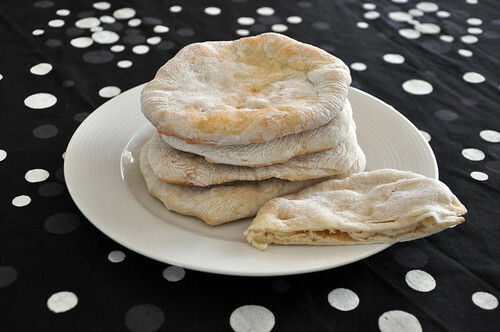 Or spread in a half pita with some sprouts and roasted red peppers, for a delicious & healthy sandwich! You can add to this basic recipe to make different flavors of hummus. I sometimes add a 1/4 of cooked black beans and a clove of garlic, for a great tasting black bean hummus. Or you can add sun dried tomato paste and fresh basil. The possibilities are endless! For the chips, I use about 3 white corn tortillas cut in eighths, coat lightly with one tsp olive oil and sprinkle with sea salt. Spread them out on a cookie sheet, and then bake for about 15 minutes at 350 until crispy. 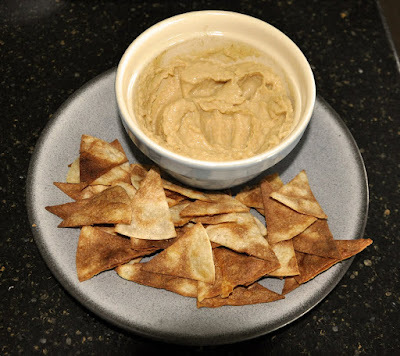 Alternatively you can make these chips with wholegrain flour tortillas or pita bread too, so good!